Yesterday I went for a run. 3 miles. The first two felt really really good and the last one I could feel my quad complaining a little, so I just slowed the pace even more. 29 minutes to run 3.2 miles. But it was running! and on such a beautiful day! yes I know my lawn looks like crap. 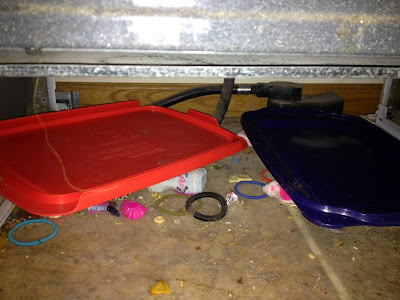 I also looked under my stove, I was looking for those two large lids. Found them. and a bunch of other stuff. Gross, but feels to good to have it clean under there again! 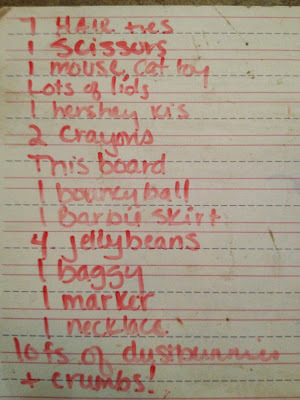 here is what I found. Sadly, no money! 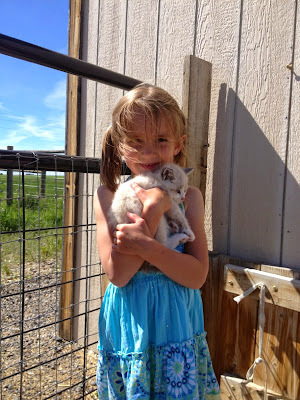 and because what is cuter than kids and baby animals. You're welcome. 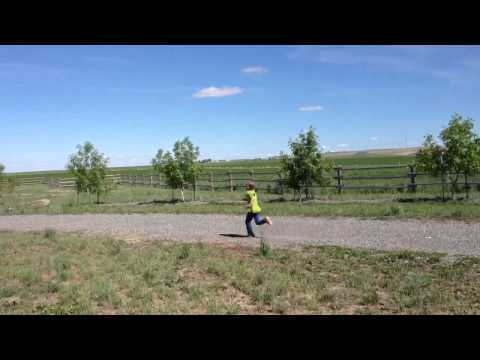 my son wanted to know if he ran really fast if his legs looked like they do in cartoons so we took a video. He was pretty impressed but still wished they looked like they do in a cartoon when they run really fast. Happy Friday! If you are interested I am giving away a Paleo Fitness and Nutrition book. Woo hoo for running, even slow (well, for you) running! The idea of looking under the stove terrifies me. It makes me so happy to be a renter. No thanks on the Paleo book :). I like pizza and ice cream. Great job running!!!! I'm afraid to look under my stove. I probably have tons of things under there as well. And mouse poop I'm sure. Ugh. Maaaaaaan ... that guy is suuuuuuper fast!!! That looked exactly like a cartoon Superhero!!! Yay for running!!! 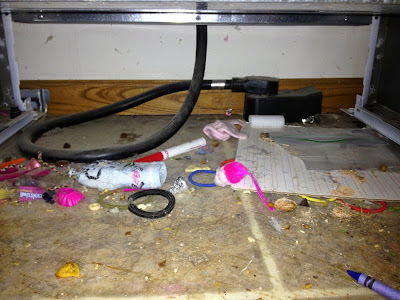 Oh we had a furry friend once under our stove...I threw away every pan that was in the drawer under the stove and then proceeded to bleach it under there....yuck! Glad all you found were little people treasures! Whoohoo, it's a run! You win! I walked 4.7 miles yesterday. 3 of those were 16 min/mile, which has my crazy runner brain so happy because I just need to make sure I average 16:30 for the AF marathon. So now, even though I feel like there's no way I can get completely ready for a PR attempt, at least I know with confidence that I will make the time cutoff, even if I have to walk the last 10 miles. Back at running and still smart as ever!!! You should have sped up the video for him. Your slow run is faster than any 3.2 miles I've ever done at top speed. How the heck does that stuff even get under there? Glad to hear you're back running again. Fingers crossed there will be more runs to come! So happy for you to get a run in. YAY I cant keep up with my lawn it is growing so fast with all the rain we are having here. Did you get all the crop in. We got our in the friday before Memorial day. Alot of farmers still have not gotten their beans in, due to all the rain. So thankful we got all our in. Have a great wk. 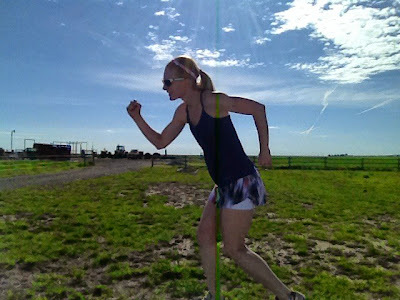 Love the running video:) Glad you got some miles in too! This is my third time trying to comment, so if you suddenly get a billion from me, SORRY! Anyway, yay for the run! Let me just say take it easy and don't push it. I've been a little to excited to get back into running and I think I over did it. My hip hurts now :( And you have some cute kids! I remember wondering that same thing about my legs when I ran. He is pretty close those, those legs are zooming! Three miles is three miles - yay for progress! You are going to have some serious running competition soon - your son is so fast his legs are out of focus! This post made me smile, thank you! Your little guy is fast, yay him! Hey, don't forget to send me your address to forward to Premier Protein! Great job on the run!! Keep listening to your quad and run smart. Stove Cave? Scary...I may have to do ours now...Love the kid-n-kitten pic! So Stinkin' cute! !